When I first heard about the money drops in San Francisco and Los Angeles, my ears perked right up. Someone is stuffing bills in envelopes and then giving the envelopes away? Wow, inconceivable! Is it a brilliant idea for a person to share his or her wealth in this way? I can’t decide. I keep thinking we’re experiencing a yet-to-be-announced reality show or maybe the makings of a video game. I’m certainly not opposed to the generosity—give away that cash! I’m just not sure if I had a gazillion dollars that I would choose to share my moola in this way. I am a big fan of paying it forward. And who pays it forward better than teachers! Every day, a teacher brings students closer to their dreams—by teaching, listening, caring, problem solving, and the list goes on. Give yourself a well-deserved pat on the back; then pay that pat on your back forward to another teacher! 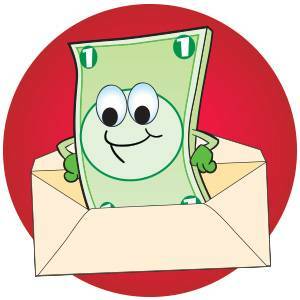 PS: If you were to find an envelope stuffed with cash, how would you pay it forward? Classroom redo. What a fun thought to pay it forward and get to enjoy it. What a great idea, Darlene! Restock my Title One school with all the needed items like school supplies, extra snacks and clothing for those who just don’t have those things! Here is my story…In July of 2011 I was finally able to get back into my condo after 7 feet of river water sat in it for more than 3 weeks. I was there packing the things I had stored upstairs which luckily did not get damaged when I was handed an envelope containing $200! What a godsend at a very tough time. I used some of it to buy gift cards for the wonderful people who helped me evacuate my condo and… someday, I will pay it forward and surprise someone in need!! What a fun day that will be! !